Grandfather Clock. Height 2172mm, Width 486mm, Depth 280mm. (Kieninger movement installation drawing included). Shell Fillings: Three @ 3.0kg. The RK movement specifications. Plate size 131mm x 131mm x 2.0mm with 6 bronze bushes. the patented Kienirramic& solid anchor Dead Beat Graham escapement, Over swinging the pendulum will automaticaly correct the tick (beat), Automatic night silencing. The movement plays the Westminster melody on the quarters and chimes the hours on an 8-rod gong. 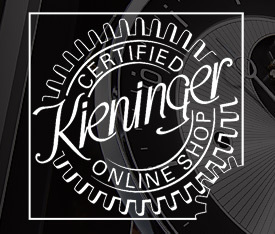 The movement requires a minimum measurement of 175mm from the inside face of the dial glass to the inside of the rear panel. The weights need to be able to drop a minimum distance of 1325 mm, measured between the centre of the dial and the inside bottom of the cabinet. When using the timber pendulum with a 140mm bob, the distance from the hand-shaft to the centre of the bob is 760mm. The swing is about 240mm. When using the grid pendulum with a 140mm bob, the distance from the hand-shaft to the centre of the bob is 720mm. The swing is about 200mm. The distance from the rear panel to the front face of the weight is approximately 140mm. 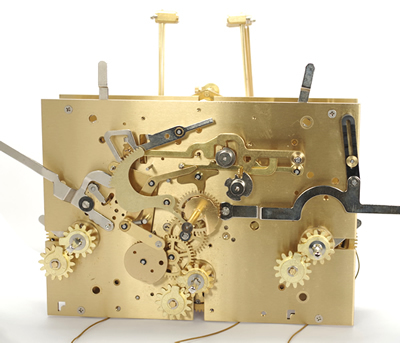 Click here to view the Set 29 Movement Dials and Pendulums images page. Click here to view the Set 29 Options and Prices page. Pendulum length 93cm. Chain & Weight Drive. The RK 046 movement specifications. Plate size 131mm x 131mm x 2.0mm with 6 bronze bushes. 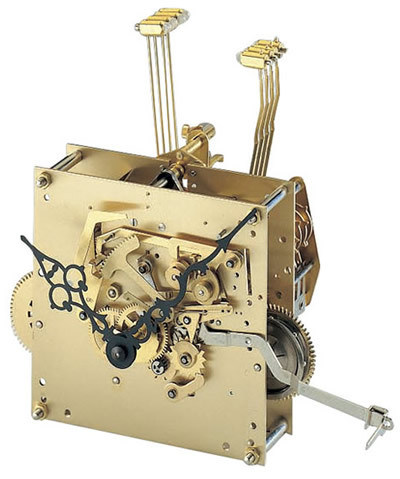 Click here to view the Set 38 Movement Dials and Pendulums images page. Click here to view the Set 38 Options and Prices page. Pendulum length 93cm. Cable & Weight drive. Maintaining Power. The KSU 38 Movement specifications. Plate size 141mm x 200mm x 2.5mm. 6 bronze bushes, manual selection of the Westminster, Whittington & St Michaels melodies, Dead beat Graham escapement, Maintaining power, Automatic Tick (beat) adjustment, Maltese cross, cable winding stops to prevent over-winding, Separate controls for Chimes and he Melodies - The control that protrudes through the left slot in the dial allows selection of - Silent, Automatic Night silencing between 10pm to 7-15am or Continuous chiming. The control that protrudes through the slot on the right side of the dial provides the selection of any of the three melodies and Silent - The Hourly chimes and the melodies are played on a 12-rod gong. This movement set requires a minimum measurement of 215mm from the inside face of the dial glass to the inside of the rear panel and the weights need to be able to drop a minimum distance of 1260mm, measured between the centre of the dial and the inside bottom of the cabinet. The distance from the rear panel to the front face of the weight is approximately 185mm. 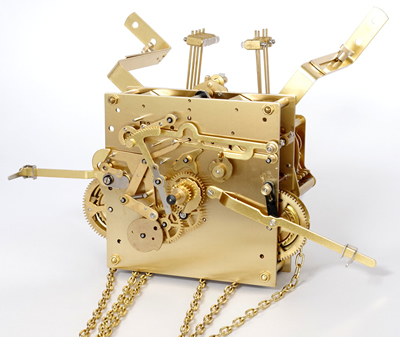 Click here to view the Set 40 Movement Dials and Pendulums images page. Click here to view the Set 40 Options and Prices page.